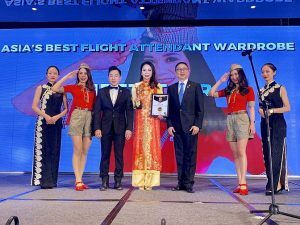 Vietjet was honored the “Asia’s Best Flight Attendant Wardrobe” award at the NOW Travel Asia Awards Gala Ceremony hosted by NOW Travel Asia Magazine, in Chengdu, China. The result was announced based on actual votes by readers’ and the judges. Vietjet’s signature uniforms were designed by European designers with inspiration taken from youth army cadet uniforms. The female flight attendants don stylised red T-shirts, bow ties, plaid shorts with matching garrison caps, and accessories such as flying wings, badges, a brown belt and the prominent red shoes. In winter, a matching vest complimenting the shorts is worn to bring out a feeling of youthfulness and freshness. The male attire on the other hand is not only smart but also dynamic with black trousers, business shoes and stylish red t-shirt. Vietjet’s uniform uniquely infuses both modern and traditional styles, ultimately creating a break-through outfit that goes beyond the framework of standard uniforms. It brings a touch of uniqueness that symbolises Vietjet’s youthful, innovative, and inspirational spirit to conquer and connect the sky. Last year, Vietjet was also honoured along with Singapore Airlines, Air France, Air Serbia, and Emirates, as one of the top five airlines with the most charming flight attendants by Canada’s lifestyle and travel website, vivalifestyleandtravel.com. Since the year 2012, the annual NOW Travel Asia Awards Gala Ceremony has dedicated itself to honouring and celebrating the outstanding performance and services of tourism service providers throughout the Asia-Pacific region. This year, the NOW Travel Asia Awards continued its recognition of the tourism industry including honouring high-end service providers such as hotels, resorts, villas etc. Aiming to be a Consumer Airline, Vietjet has continually opened many new routes, added more aircraft, and invested in modern technology, while offering more add-on products and services to serve the demands of customers. Vietjet has been a pioneering airline, winning the hearts of millions of travellers thanks to its exciting promotions, in-flight entertainment, especially during the festive seasons. With high-quality services, diverse ticket classes, Vietjet offers its passengers flying experiences on new aircraft with comfy seats and delicious hot meals served by a dedicated and friendly cabin crew, and many more enticing add-on services.